Potatoes are a great resource for our diet. They can be cooked in many ways and their flavor matches an infinite number of ingredients. The casserole that I propose can be used as a side dish and is suitable for simple things like fried eggs, sausages, or baked fish. For vegetarians, this dish can be a tasty dinner. In a pot, bring about a quart of water to a boil. Meanwhile, peel the potatoes and cut into thick slices. When the water boils, add the potatoes and bring them to a boil for 5 minutes. Drain the potatoes and let them cool. Cut the onion into thin slices and let them sweat in a pan with a tablespoon of olive oil and salt. In a bowl, mix the potatoes with the oregano, olive oil, salt, and pepper. 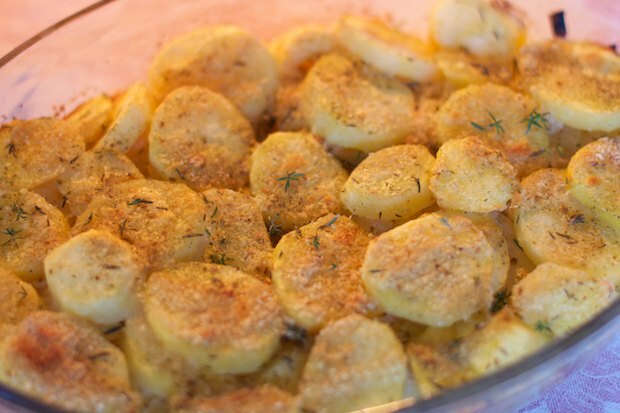 In a baking dish, place a layer of potatoes then distribute the onions over the potatoes, and close with a layer of potatoes. Finally, sprinkle the dish with bread crumbs. Cover with foil and bake for 30 minutes. After 30 min, remove the foil and continue baking until the top is golden. Serve nice and hot, fresh from the oven. Posted in Vegetables and tagged with Patate all’Origano, Potatoes with Oregano. RSS 2.0 feed.